First off, it must be said that all you’ve heard about the remarkable attributes of the titular giant gorilla -- designed by Sonny Tilders -- are absolutely true. He’s amazingly lifelike, despite the visible puppeteers (King’s Men) controlling him, and the overhead cables providing added support and mobility. The face, operated by offstage computer wizardry, is extraordinarily expressive. All the visible manipulation (or most of it anyway) is forgotten once the action starts going, much as one came to ignore the handlers in the wondrous “War Horse” a few seasons back. But, in all fairness to the creative team, there is more. For starters, Christiani Pitts, in the quite enormous role of Ann Darrow (the Fay Wray character), gives an impressive performance, and manages to make us believe she has a real bond with the creature. Coupled with all the dancing and singing (and she does have several demanding solos), the result is quite a tour de force. Her character’s career ambition and her empathy with Kong register as real and touching as she plays with such conviction. And she’s immensely likable. The scenic and projection design by Peter England is immediately striking from the start. In the show’s opening moments, gritty New York period scenes and construction girders pull you right into the 1930s period. The same can be said for Roger Kirk’s costumes. Peter Mumford’s lighting is also first rate, and is astutely used to showcase Kong to maximum advantage and, when necessary, mask the obvious trickery behind the illusion. Peter Hylenski’s sound, including the fearsome roar before the creature’s first appearance, skillfully adds to the effect. Marius de Vries’ score and Eddie Perfect’s songs have been dismissed by many as generic, and it is true they are mostly serviceable in the way of so many current musicals, and certainly -- apart from a couple of pastiche chorus girl numbers -- utterly devoid of Thirties flavor. But having had the opportunity to see the show first in an early preview, and then post-opening, afforded that rare chance to experience a new score twice, and I must confess I admired the music far more the second time around, without necessarily wanting to rush out and purchase a CD. Jack Thorne, who co-authored the intelligent script for “Harry Potter and the Cursed Child,” is dealing with a more simplistic tale here, but has done a more than creditable job, playing up the theme that both Kong and Ann are being victimized. And hats off to him for including reference to three actual musical theater ladies of the period: Mary Ellis, Vivienne Segal, and Adele Astaire. Still, apart from some other nods to Depression-era bread lines and some Hollywood name dropping like Clara Bow, the language is strictly contemporary. In Thorne’s telling, Ann is a small-town farm gal who’s come to New York to make it big on Broadway, but rejection follows rejection, and thus when she and ruthless film director Carl Denham (Eric Williams Morris) “meet cute” in an eatery (he buys the starving young woman a sandwich), she’s willing to accompany him on a mysterious shoot in far-off Skull Island, and promises to make her a star. He does, however, expect her to act the damsel in distress, a role she simply can’t enact, in real life or on film. Proudly and defiantly self-sufficient, like seemingly all female heroines these days, she never seems to need a man to protect her or rescue her. That’s just as well as Carl, in this version, is particularly repugnant and self-centered. So her leading man here is definitely meant to be Kong, underscoring the story’s “Beauty and the Beast” parallels. The shipboard journey to Skull Island -- striking projections again -- lead to tensions with Carl and Captain Englehorn (Rory Donovan) which are only resolved by Ann’s resourcefulness. No sooner have they gotten to the island, and Ann is hanging from the foliage in mock distress, than we hear the resonant roar of Kong (Jon Hoche offstage). I didn’t care much for the stylistic rendering of the forest with zig-zagging wires that seemed out of place with the realism of other locales. But Thorne does take a misstep in having Lumpy advise Ann that Carl needs a “kick in the balls.” A 1930’s man would never use language like that in front of a lady, just one of several anachronisms in the script. Director Drew McOnie’s choreography, mostly used for NY hustle and bustle, is crisply executed by the ensemble, and indeed, is staging throughout is savvy. The audience members around me responded very enthusiastically, so as popular entertainment, if not high art, this show very much succeeds. 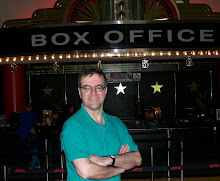 I sat next to rabid fan of the original film, and he was one of the first to leap to his feet during the curtain calls. 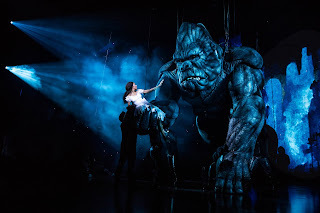 Nearly all of Kong’s stunts elicited spontaneous applause throughout the show. “King Kong” is definitely a crowd-pleaser.